Last month, I went to the dentist three times. 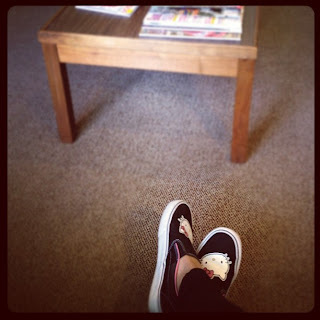 There was a checkup visit, a second visit to replace two cracked fillings (during which I endured 3 painful shots to numb me which did not work), which led to a third visit to actually replace the fillings (this time I got numb after 4 painful shots, yay!). As you can see from my Instagram picture, I wore my favorite Hello Kitty shoes to cheer myself up ... I was really nervous! The day after my fillings were finally replaced, I announced out loud that I was going to make a rhubarb tart, to which my husband promptly reminded me, "Think of all the trips to the dentist you just had!" But, fueled by my recent revisit to baking with rhubarb, I insisted that I must do it while rhubarb was still in season! Although, I compromised with him - based on my husband's theory that honey doesn't give you cavities (question for you dentists out there - is this true? 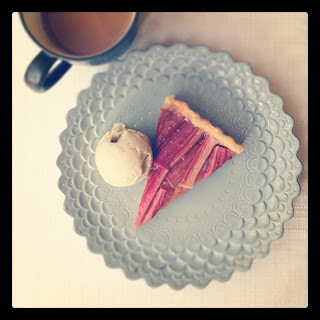 ), I decided to try making this rhubarb tart with honey instead of sugar. Usually I make my rhubarb tarts in this round tart pan with removeable bottom, but this time I chose to use my new rectangular tart pan (similar to this one). So I made my favorite all-butter pie crust, and carefully rolled and lined my tart pan with the dough. Then I sliced my rhubarb and mixed it with honey (about a half cup), a pinch of salt, and a couple of tablespoons of flour. Then came the fun part - arranging it in the tart pan! I've tried arranging it in a vertical pattern as seen here, as well as a horizontal pattern as seen here, but this time since I was using a rectangular tart pan I decided to make two long rows of rhubarb. Then I brushed the exposed pie crust with egg wash, and sprinkled on a bit of sanding sugar before popping it in the oven. After about 50 minutes in the oven, it was done! By this time the whole house smelled delicious. When I first sliced it, I didn't love the way the rectangular piece looked. I was starting to think I should have made it in the round tart pan after all. But then I realized that I could still slice it into triangular pieces. In love with rectangular tart pan once more. It's even better with a scoop of ice cream. For breakfast. With a cup of coffee to top it all off. The end. @overtimecook.com - thank you! i love rhubarb too! you totally should get a rectangular pan, it's so pretty when it comes out of the oven! @Baker Street - thank you! actually i loved the taste of the honey with the rhubarb, but it made the tart crust a little more soggy than when using sugar. i think next time i'll try a combination of honey and sugar so the mixture is not so wet! Looks so complicated, yet so simple. I love the tart pan and the triangles! I'm so impressed! Looks delicious! Congratulations on making the foodbuzz Top 9! Gorgeous--found you on the foodbuzz Top 9. I've pinned this to my rhubarb idea board. I love the idea of using honey. @Sara - thank you! so glad you found my blog! that's awesome that you have a rhubarb idea board!!! kust wanted to know how u made your blog?? was is through wordpress ? @Haniya - thank you! so glad you tried it and liked it! :) and to answer your question, the blog is done through blogger!